Obituary for Joan Adele (Ciafullo) Burnitskie | Bayonne Memorial Home, Inc.
Joan Adele Burnitskie (nee: Ciafullo) passed away peacefully at her residence on Saturday, November 24, 2018. She was born in Bayonne to the late Minnetta (nee: Sharrott) and Guiseppe Ciafullo. She was a lifelong Bayonne resident and a homemaker. Mrs. Burnitskie was a devoted and very active member of Grace Lutheran Church. She was a willing women worker, a worship assistant, a member of the Altar Guild, served on the Church Council, and baked Communion bread. She was also an avid supporter of the Hudson County Animal League. Mrs. Burnitskie was predeceased by her beloved husband, Thomas Burnitskie, Sr.; and her loving children, Thomas Joseph Burnitskie Jr., Kurt Eric Burnitskie, and Margaret Burnitskie. 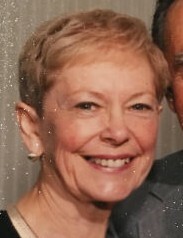 She is survived by her loving daughters, Robin Burnitskie and Jacqueline O’Hara; her cherished grandchildren, David Burnitskie, Alen O’Hara and Jodi O’Hara; her adoring great grandchild, Aidan Alvarez; her dear late siblings, Joseph Anthony Ciafullo, Anthony Charles Ciafullo, and Clifford Robert Ciafullo; and many loving nieces, nephews, grandnieces and grandnephews. The funeral will be conducted by Bayonne Memorial Home, Inc. on Wednesday, November 28, 2018. A funeral service will be held at Grace Lutheran Church at 10:00 a.m. followed by interment at Holy Cross Cemetery, North Arlington. Visitation will be held at the funeral home on Tuesday, November 27, 2018, from 5:00 p.m. to 8:00 p.m. Donations may be made to the Grace Lutheran Memorial Fund or the Hudson County Animal League.